Chilkat blanket attributed to Mary Ebbetts Hunt (Anisalaga), 1823-1919, Fort Rupert, Vancouver, British Columbia. Wikimedia Commons. There are many falsehoods surrounding the collecting of American Indian Art. These myths are often perpetuated by the media and cemented in the minds of an ill-informed public. A more nuanced understanding of the roles certain objects play in Native American culture is therefore necessary. This brief essay highlights a particular event in which myth, reality and a number of convenient assumptions collided. The article was quickly picked up on national news and social media. 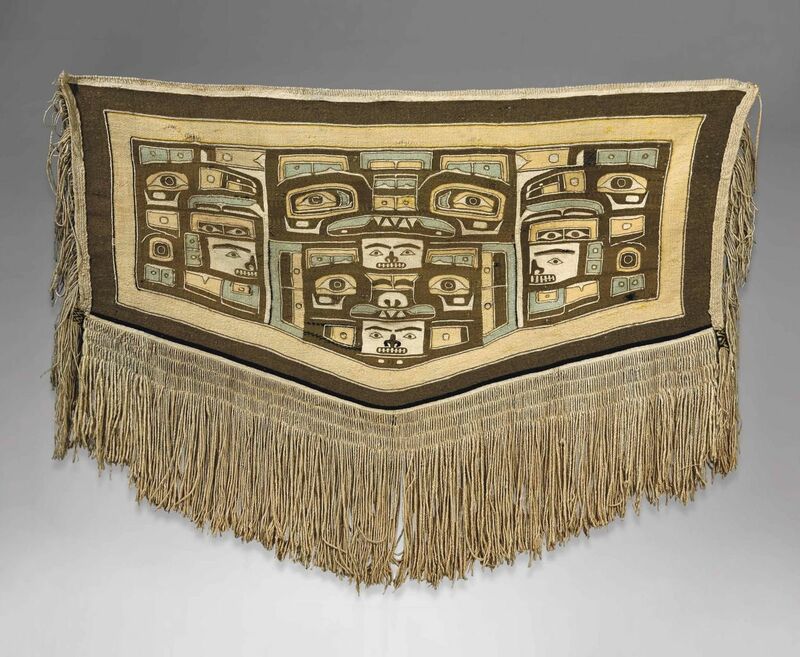 The Chilkat blanket belonged to a Seattle-based collector, named Bruce Jacobsen. He purchased this Chilkat in the 1990s from a local dealer. 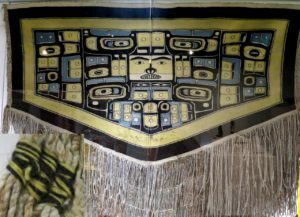 In 2017, the story goes, Jacobsen’s daughter convinced her father to give the textile to the Tlingit people. She had seen a similar example in a text book, learned about the textile’s cultural importance and felt that her family was “trespassing on traditional Native culture”. 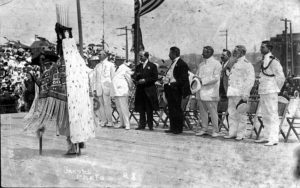 Parade showing Native American in full regalia typical of the region, with President William Howard Taft with dignitaries in the background, Seattle, circa 1909, probably approximately 1909-09-30. Alaska-Yukon-Pacific Exposition Collection, University of Washington Libraries. Photographer: Jacobs. Wikimedia Commons. But, there is another side to this story. These blankets were initially made by the Tsimshian people of Northwest Coast, but the garment was adopted by many surrounding tribes, most notably the prolific Chilkat Tlingits, after whom the textile is named today. 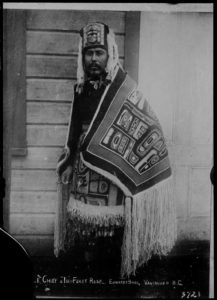 Chilkat blankets were status-symbols worn typically by male elites at potlaches and ceremonies. Owning one necessitated incredible wealth, as the blankets take a year to make. Because of their importance, they were sometimes hung outside of grave houses to honor a high-ranking, deceased tribal member. However, SHI’s claim that Chilkats are somehow “sacred” is misleading. “Sacred” has specific legal connotations under the Native American Graves Protection and Repatriation Act which would suggest that Chilkats are deserving of repatriation from federally funded museums. But Chilkat blankets are neither illegal to buy nor illegal to sell in the private sector. They never have been. Vancouver Public Library, Accession Number: 2675 Date: 1902 Photographer/Studio: Edwards Brothers Topic: Indians of North America – Costume and adornment Costume Indian art Niska Indians Location: British Columbia – Nass River Valley. Wikimedia Commons. A collection tag from a late 19th century Chilkat recently acquired by the Bowers Museum in Santa Ana, California, indicates not only the name of the wearer, but also that the Chilkat was likely purchased directly from the weaver. Another Chilkat was bought at a Parisian auction for $27,368 dollars by the Canadian Heritage Fund and then gifted back to the originating tribe. Canadian media asserted this item was “repatriated”. To use the term “repatriated” is misleading, because it implies some sort of wrongful ownership. Rather the textile was bought legally and then donated. It turns out that this textile had documentation which supported the idea that it was made for commercial sale, as the weaver helped to run a trade shop with her Anglo husband. The irony of all this is that, up until recently, you could buy a contemporary Chilkat directly from the Sealaska Heritage Institute website for eighty dollars. The Jacobsen Chilkat story illustrates an important paradox surrounding the collecting of American Indian Art. It also highlights the importance of using precise language when we describe these objects. Was the media right to say the Jacobsen Chilkat was sacred? How can something be sacred if there is substantial evidence to also suggest that the same object type was made for commercial purposes? How do we ethically navigate a confused collecting climate in which an earlier generation of indigenous artists can sell something as a trade object, but a later generation feels justified in reclaiming it later? 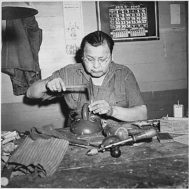 There is a long established history of Chilkats being made by Native American artisans for public consumption by both indigenous and non-indigenous buyers. It is for this reason that many Chilkats currently reside in institutions and private collection throughout the country. In many instances, their collection histories date go back into the 19th century. Older examples continue to come on the market from collections and they continue to be sold for various non-traditional purposes. I have even heard of one that was used as a theatrical prop for an extraterrestrial set at a Hollywood Studio. How are some Chilkats more sacred than others? And which ones deserve to be returned? In today’s market, Chilkats hardly seem to be the rare or non-marketable specimens that the media has suggested. 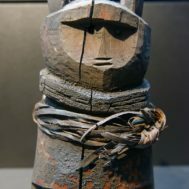 Since the Jacobsen and eBay Chilkats were returned to the Tlingit, a number of examples have emerged at public auction. A top-tier example sold at Sotheby’s, New York, in November of 2017 for $62,500 dollars; another sold this April at Cowan’s Auctions in Ohio for $23,370. Another is scheduled to be sold at the auction house Skinner’s in Boston on May 5th, with an estimate of $35,000 to $45,000 dollars. Having sold in the past for upwards of $250,000 dollars for masterworks, their reduced sales performance in the marketplace may be due to the erosion of owner confidence related to the highly publicized Jacobsen return. Antique Indian art is an incredibly expansive field. Ninety-nine percent of this material falls outside of the scope of either the sacred or the illegal. But it’s the 1% that can sometimes be contentious. In this realm, words like “repatriation”, “sacred”, “illegal”, “stolen”, and “cultural patrimony” can be used without much thought. These terms have very specific meanings. They should be used only where appropriate – not where they mislead. It’s especially important not to use words that imply that a crime exists where it does not. I wanted to use the example of the Jacobsen Chilkat to highlight the following key idea. Tribal people, art historians, anthropologists, archaeologists, and sociologists have all weighed in over the decades on how we look and talk about Native American objects. And the debate is ongoing, because it remains unclear as to how we should view these objects: should we treat them as artifacts to be studied to illuminate the past? Should they instead be viewed as the sacred living embodiment of an ongoing cultural heritage? Or, should these objects be seen as Art? 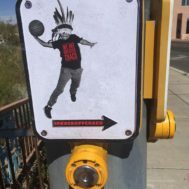 Equally important: to whom should Native American material belong, particularly when something can be perceived as culturally significant or “sacred”? Whatever your answer, follow it through, and consider the long term consequences, be they legal, academic, as they play a role in Native communities, and as they exemplify a key part of American history. Thomas Cleary owns Thomas Cleary LLC, a Santa Fe, NM brokerage firm specializing in buying, selling, and appraising American Indian art for private clients and museums. He was formerly Director at H. Malcolm Grimmer in Santa Fe. Cleary has written and spoken prolifically on American Indian art. The excerpt below is a transcribed and edited version of the speech he gave at the School for American Research in Santa Fe, delivered on April 26, 2018. See a short video on Chilkat weaving from the Smithsonian Museum. And a video of weaving students dancing with their creations.